It’s Democratic Socialist versus Republican Billionaire, fighting over the issues a week before the 2016 Texas Primary! 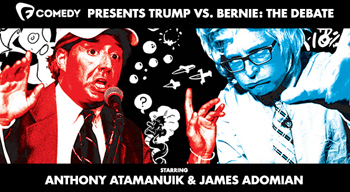 Bernie Sanders (James Adomian) and Donald Trump (Anthony Atamanuik) will hold a live, unsanctioned bipartisan exhibition debate at Stateside at the Paramount. The gloves are off in this Queens vs. Brooklyn showdown, and you won't want to miss it. Join us for a Post-Show Happy Hour! Tickets to the Anthony Atamanuik and James Adomian Trump vs. Bernie Clash of the Titans show are sold out, but there's no need to filibuster: Paramount Social Presents is hosting an equal opportunity post-show happy hour for all. 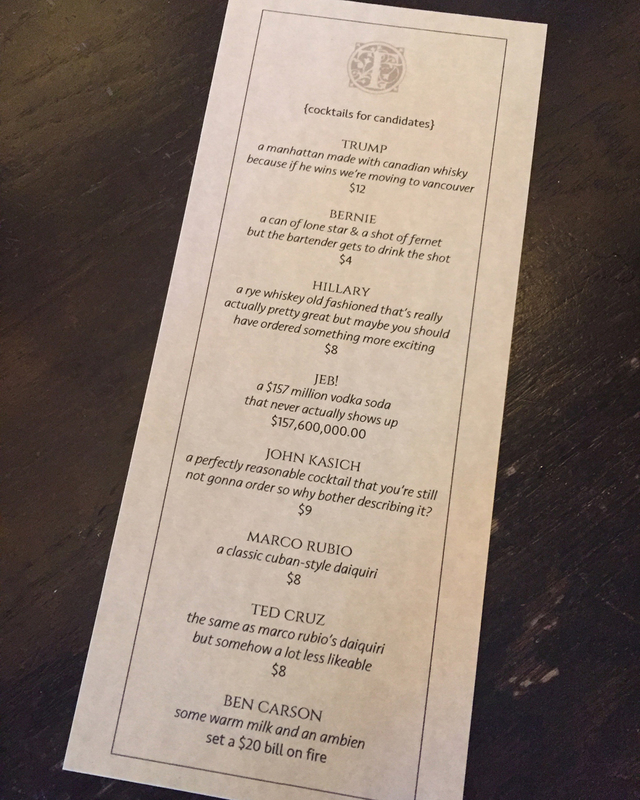 Just across the street, the Townsend has come up with a special menu with Trump Vs. Bernie drink specials running until close! JAMES ADOMIAN is a daredevil dancing queen – but don't you know deep down he's just a kitten! James is a prolific performer/writer/standup who is a staple in the comedy scene in LA, NY and across the country, recently honored as one of The Advocate's “Top 40 Under 40” in 2013. James is a regular standup and character guest on Comedy Central, with recent appearances on @MIDNIGHT, THE MELTDOWN WITH JONAH & KUMAIL and JOHN OLIVER'S NEW YORK STAND-UP SHOW, and on IFC where he has appeared on COMEDY BANG BANG and MARON. He is currently developing THE EMBASSY, a pilot project with Earwolf and Scott Aukerman. Other TV appearances include LAST COMIC STANDING, ADVENTURE TIME, AXE COP, GRAVITY FALLS, CONAN and a memorable set of character cameos on CHILDREN'S HOSPITAL. He co-stars in HITS, the directorial film debut of David Cross that premiered at Sundance in 2014, and appeared in HAROLD & KUMAR ESCAPE FROM GUANTANAMO BAY. On the internet, James has guested on many podcasts including COMEDY BANG BANG, DEAD AUTHORS, SKLARBRO COUNTRY, THE TODD GLASS SHOW and KEITH AND THE GIRL, and has produced and starred in a wide array of comedy videos and web series on Funny or Die, including DRUNK ORSON OUTTAKES and MARON IN SPACE. Catch James Adomian doing his standup and characters across the globe at festivals, comedy clubs, gay bars, rooftop parties and radical political events. His acclaimed debut standup comedy album LOW HANGIN FRUIT is available for purchase on Earwolf, and available for theft elsewhere.